There goes one dream that I’ll never realize: seeing the life-size Gundam statue in person. On March 5, a ceremony was held to officially announce the dismantling of Namco Bandai and Sunrise’s life-size statue of the original Gundam, the RX-78-2. The statue was completed in 2009 and first installed in Tokyo’s Toritsu Shiokaze Park. It was moved to Shizuoka in 2010, and then again to Odaiba’s Diver City Tokyo shopping mall in 2012, where it spent the past 5 years. In case you’ve never heard of the statue, at certain times of the day the statue’s lights would turn on, and it would move its head and spew vapor from its chest vents. It’s awesome. It was awesome. But as you can see in the concept image up top, a new hero will take The White Devil’s place. 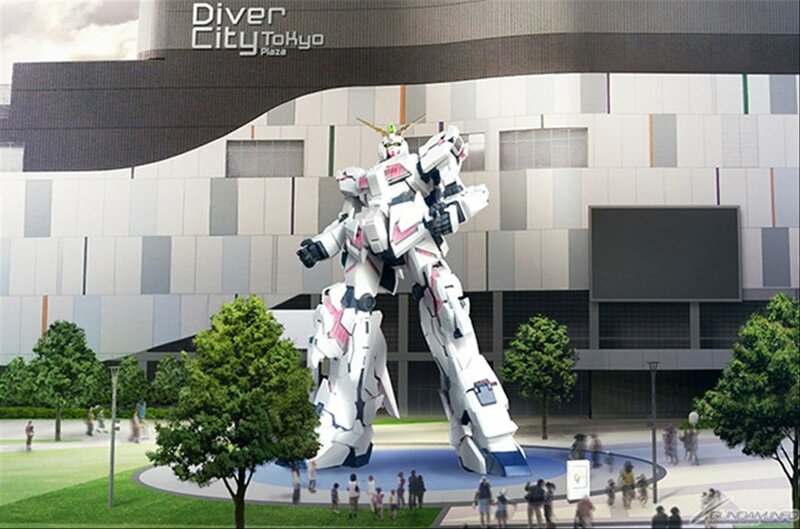 The Gundam Fan Club recently announced that a life-size statue of the RX-0 Unicorn Gundam from the Mobile Suit Gundam Unicorn manga and anime series is currently being built and will be completed later this year. It will also be installed in front of Diver City Tokyo. Even though life-size statues of Mobile Suit Gundam 00‘s first four mecha would’ve given me no choice but to visit Japan annually until I die, the Unicorn should also be a sight to behold. Especially if it can transform just like its fictional counterpart.